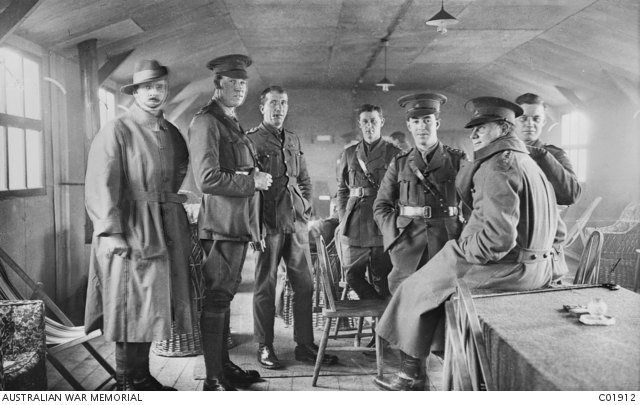 Informal group portrait of seven officers in the anteroom of the officers’ mess at Westham Camp, No 2 Australian Command Depot, on the southern coast of England. Identified left to right: Captain Raymond Gordon Kellick, 13th Battalion; Lieutenant Henry Arthur Jones, 2nd Battalion; Lt Thomas Spencer Howard, 8th Light Horse Regiment, who was killed in action on 7 August 1915; possibly Captain David Leslie Todd; Capt Archibald Jamieson Dunn, Australian Army Medical Corps; Lt Kenneth Grant Jacob, 3rd Brigade, who was killed in action on 30 May 1918. UK. 1916. 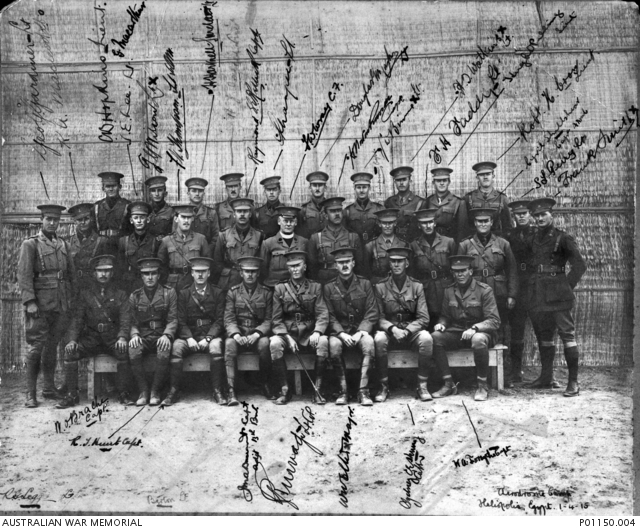 Group portrait of officers, many from the 13th Infantry Battalion, annotated “Aerodrome Camp”. Some in this group died at Gallipoli. Left to right: back row: Lieutenant (Lt) Clive Boyer Hopkins (killed in action 20 July 1916), Lt F G Wilson, Lt Hubert Hartnell-Sinclair (died of wounds 9 August 1915), Lt Horace James Salier, Lt Francis George Grainger, Lt Douglas Marks, Lt George Webster Binnie (killed in action 3 May 1915), Lt Harold Thomas Watkins (killed in action 25 April 1915), Lt Hugh O Pulling, Lt Robert Harold Crow (killed in action 3 May 1915). Middle row: George G Gardiner, Lt Kenneth Alexander MacLeod (killed in action 3 May 1915), Captain (Capt) Joseph Edward Lee, Lt Francis Vere Thompson QM, Capt Raymond G E Kellick, Chaplain F W Wray, Capt Harold Norton Russell, Capt J Simpson, Lt Francis Horatio Faddy (killed in action 3 May 1915), Capt Cyril Shellshear, AAMC, Lt Stanley Llewellyn Perry, Lt Frank Smith. Front row (all seated): Capt William Osmond Brache, Capt (later Major (Maj)) Robert Thomas Hunt, Lt (later Maj) Reginald George Legge DSO MC, Capt (later Lieutenant Colonel (Lt Col)) James Murdoch Archer Durrant (Adjutant 13th Battalion), Lt Col Granville John Burnage, Maj Walter Whyte Ellis (killed in action 3 May 1915), Capt Sydney Charles Edgar Herring, Capt William Alfred Forsythe. Also shown is the signature of Lt Barton.